Jennifer Matarese interviews Burt Ward "Robin" on "Batman" about his Gentle Giants Dog Food. NEW YORK (WABC) -- Burt Ward played "Robin the Boy Wonder" on TV's Batman, and now he's gone from Caped Crusader to Canine Crusader. "My dear friend Adam West and I had the greatest time, I have the greatest love and respect for him, we did a show that captured the heart of millions of people and we had a great time doing it," Ward said. Ward's passion for animals spurred him and his wife Tracy to open a non-profit foundation to save dogs, Gentle Giants Rescue in Norco, California. He says that through saving 15,500 dogs, he took an interest in developing a healthy dog food that wasn't only top of the line, but affordable. "At all times my wife and I have a minimum of 50 in our house! We have a special permit in our city," Ward said. "In the course of saving them, we found a way to extend dogs' lives. Our special Gentle Giants Dog Food which is our charity, we take no salary from it by the way, our food has dogs living up to 27 years!" He says they are healthy into their 20s and "running around like puppies." Ward's own personal dogs, Tara and Sugar are 24 and 27 years old. He says they have doubled the average lifespan of their rescued giant breed dogs, and significantly lengthened the average lifespan of their rescued small and medium breed dogs as well. The instructions on how to feed your dogs and the feeding plan are on his charity's website. He says that your dog's lifespan depends on three things, "How you care for your dog, how you feed your dog, and what you feed your dog." If you find it hard to believe, the Ward says that he and his wife have the medical records showing the ages of all of the dogs whose ages are printed on the dog food bag and in their literature. 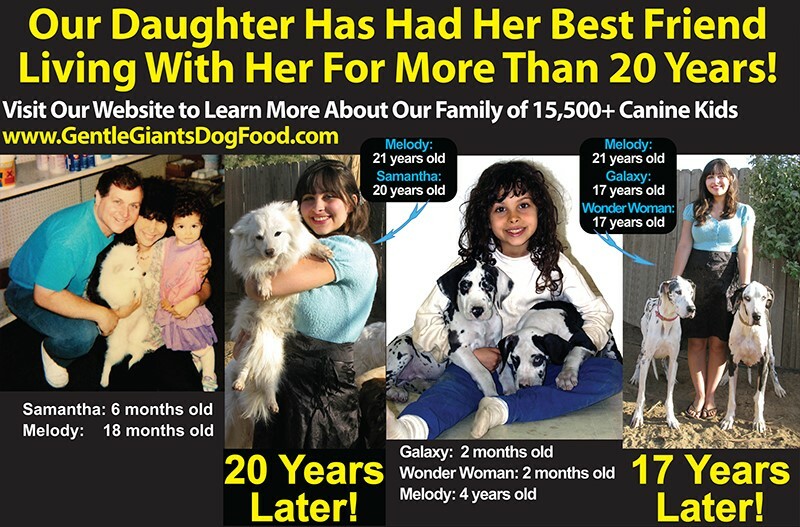 100 percent of the profits from Gentle Giants Dog Food goes towards the Gentle Giants Dog Rescue.